We also offer a restoration service for woden decking which includes full cleaning, moss removal, re oiling or re varnishing. We can also give your decking or patio furniture the same treatment if required. As you can see in these pictures this decking in Great Doddington, Near Wellingborough was covered in green moss which the customer was concerned about as when it rained she had very slippery decking. You can be assured with our service we use the correct products to not only eliminate the unsightly green stains but once the decking has been treated it prevents regrowth and means it is easier to keep the decking clean and it is far less slippy especially in the wet. Once the moss treatment had been applied it was followed by a thorough machine clean and washed down and rinsed with a professional pressure washer. It was then left to dry and out and I returned on a dry day and on this occassion the customer chose an oil treatment to bring out the natural colour of the wood. The same process can be used to restore wooden garden furniture. This customer in Welford, a village North of Northampton had her brick patio cleaned and asked if I would be able to do anything with her wooden furniture. She opted to just have the furniture cleaned on this occassion but was extremely happy with the results. 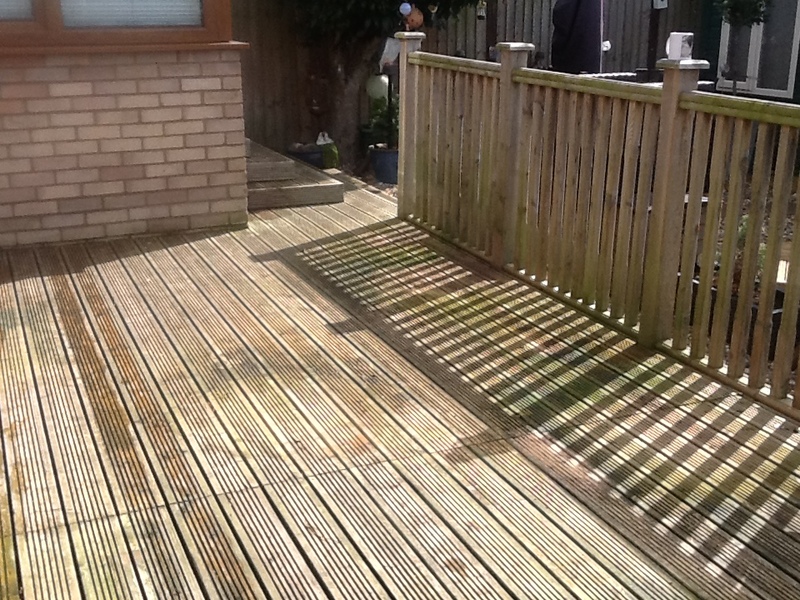 The decking was in extremely bad condition and the customer was worried that she would have to have it replaced. She was extremely happy with the results and was amazed we managed to restore her decking ready for re oiling.